In the movie, Face/Off, Nicholas Cage and John Travolta exchanged faces. Cage's character had difficulty coping with the scenario as his nemesis, Travolta, took over his life. Just as in the movie, the psychological impact of having a new face lays heavy on the patient. Since face transplantation is relatively new (there only have been 19 face transplant patients in the world), knowing how patients cope with their lives after the surgery is very important. Face transplantation is not for cosmetic purposes, patients selected for this reconstructive surgery have undergone horrible accidents and suffered facial deformities necessitating this procedure. The concern is not if the patients need the procedure but what can doctors do to ease the transition to a new reconstructed face. Facial transplantation is still in its early stages and unlike the movie, the resulting face is far from perfect. 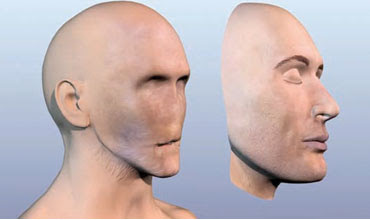 The face is the central sense organ and it is complicated to manipulate bone, flesh, and muscles to conform to a designed structure. 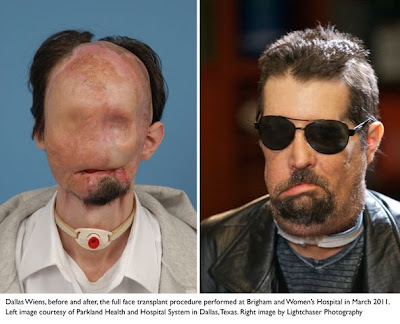 Facial transplant operations are often portrayed as dramatic before-and-after stories but new research shows that the procedures' real long-term impact may sometimes be underreported, explained researchers from The Johns Hopkins Hospital, Baltimore, MD. An analysis of patient outcomes data found that a recently developed standard scoring system called "the FACES score"—which measures a patient's ability to return to a normal life—has not been fully utilized for some patients who have already undergone facial transplants, accord-ing to reconstructive surgeons who presented study results at the 2012 American College of Surgeons Annual Clinical Congress. "Facial transplants are not just about reconstructive surgery," explained Chad Gordon, DO, assistant professor of surgery at The Johns Hopkins Hospital and clinical director of the hospital's facial transplant program, which launched in August 2012. "The face represents so much to someone's life. It's about taking someone isolated from society and putting him or her back into society. We're spending millions to research and perform face transplants, but we don't know if patients are getting back into society. Are they getting jobs? Are they able to live on their own? Or are they still socially disabled?" To date, only 19 face transplants have been performed worldwide. When Dr. Gordon's team looked at postsurgical FACES data on all 19 patients, only eight had complete reports—three from the U.S., three from France, and two from Spain. "Surprisingly, we found that many of the reports were incomplete," Dr. Gordon said. "We have no idea if these patients found a job, got married, or are living on their own." With the lack of reporting, patient outcomes of face transplant procedures cannot be properly assessed and patients may not be receiving the best postoperative followup and care. Better return-to-society reporting, could help surgeons under-stand and improve upon the procedure's success, he said. Furthermore, better reporting can help us to reassess the reconstructive surgeon's role in patient care—from the time the operation is performed—to the patient's return to normal life, he explained. In December 2008, Dr. Gordon was on the Cleveland Clinic surgical team that per-formed the nation's first facial transplant on a woman who had been shot in the face by her husband. After that operation proved successful, Dr. Gordon developed a five-pronged assess-ment tool called the FACES score to screen future patients. The FACES assessment was also designed to measure postsurgical clinical and social outcomes based on five criteria: functional status, aesthetic deformity, comorbidities, exposed tissue, and surgical history. Functional status measures how well the person performs in society, as well as whether the person leads a functional life, such as being self-sufficient and maintaining relationships. While comorbidity criterion considers how well vital organs work, particularly the liver and kidneys, aesthetic deformity looks at the severity of the facial injury and the patient's other health conditions, along with lifestyle habits that could lead to health conditions (for example, smoking or excessive drinking). The final two measures look at exposed tissue—or how deep the facial wound is—and surgical history. Patients who have already had numerous operations usually have accumulated a lot of scar tissue, which makes the facial transplant more complex. On a scale of 10, an overall score of 45 or higher indicates an ideal face transplant candidate. "Patient selection is a key to success," Dr. Gordon explained. The mean presurgical FACES score for the eight patients who had complete reports was 29.3. Following the operation, the score dropped to 16.4. "The purpose for the screening tool is to identify patients with higher FACES scores, meaning those who needed surgical treatment the most," Dr. Gordon explained. "By their scores going down, it tells you that the scoring system is working, and the transplant was successful." Among the five subcriteria, aesthetic deformity and exposed tissue proved to be statistically significant. Mean scores dropped from 9.33 and 7.77 to 1.13 and 0, respectively. Dr. Gordon said the other three criteria that proved to not be statistically significant are likely due to the small number of patients included in the study. The dearth of long-term outcomes data signals a need for surgeons to rethink their role in patient care for this patient population. "Surgeons are taught to talk about what the problem was and how we fixed it," Dr. Gordon explained. "But we're not taught to look at the functional effects, the psychosocial benefits. I know it sounds cliché, but we need to look at the whole person. As reconstructive surgeons, we need to evaluate more critically the psychosocial and functional benefits of face transplantation, in addition to the obvious reconstructive benefits," he said. Considering outcomes beyond clinical measures could mean that surgical societies, medical care centers, and donor registries have to make a deliberate, joint effort to track facial transplant patients, Dr. Gordon said. "Then, when there are doubts about taking these extra steps, we can show there are huge benefits to following these patients long after their operations are completed," he concluded.